User retention is the defining metric for successful mobile apps. The value of incorporating deep links into user retention strategies has been proven not just in quantifiable metrics, but also in intangible benefits like a memorable user experience. In my previous post, I discussed the science behind deep linking and how to implement it. Now, let’s see why deep linking is a killer tactic for customer engagement and retention. Here’s an example from Netflix: I recently received an email asking if I would like to continue watching a show I stopped mid-way. I was bored, so I clicked the link. The link didn’t just take me to the Netflix homepage or simply launch the app on my phone. It triggered the app to open the player and start the show from the exact point where I left off. By taking me right back into the action, instead of just taking me to my profile or my watchlist, I’m 100% re-engaged with the content and the app. Apps put so much money and effort into acquiring new users, only to lose more than 60% of them after only the first couple of uses.Many businesses are already running personalized drip campaigns or push notifications to onboard new users — or maybe both. But first-name level personalization isn’t enough. You need behavior-based personalization to truly engage users. 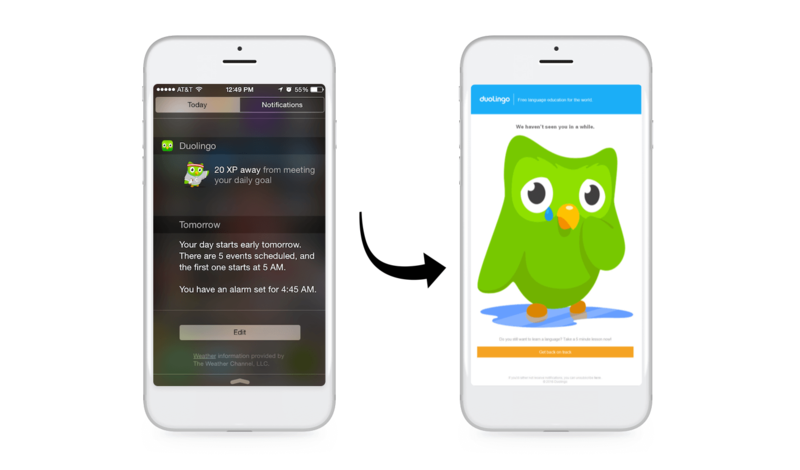 Duolingo is an excellent example of a deeply personalized onboarding flow. If for some reason you install and then do not return to the app, the way they reach out to you reminding of your progress and steps left to complete the onboarding. Are you still recovering abandoned carts like it’s 2015?Too many apps share a coupon code via email or push, leaving users to launch the app, navigate to their cart, add the coupon code… and not doze off in the middle. Deep linking is so much more user-friendly. Instead of sharing the cart link and a coupon code, a deep link can automatically apply the relevant coupon code when a user clicks. The user is taken right to their cart, sees the discount auto-applied, and clicks checkout. Isn’t that better? Retargeting or remarketing is one of the most effective engagement techniques. Remind inactive customers of your app with an ad that appears on any other website or mobile app they use, and get them back to your app.Adding deep linking to remarketing campaigns gives you an extra edge. When someone clicks an ad, they get to the exact point where they dropped off. Deep links deliver a seamless user experience. 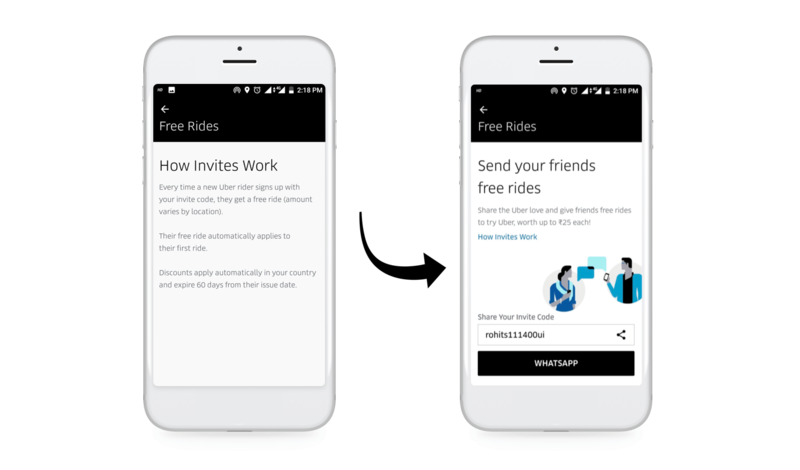 Many of today’s fastest-growing apps use referral marketing to lower their customer acquisition costs while engaging existing users.Take a look at Uber’s referral marketing, which takes advantage of deep links. When a user signs up with a referral link on Uber, their first ride is free. There’s no hassle of entering complicated referral codes. There’s no doubt that deep links are becoming an essential part of the mobile marketer’s toolkit. And we’ve now discussed how to use deep links to move the needle for user acquisition, engagement, and retention — the 3 critical metrics for mobile app growth. Are you using deep linking in your mobile marketing campaigns? Share your thoughts in comments below, and let us know how you’re using deep links to improve your user experience.